The Gonzalez Classic Bass Clarinet reeds are designed for the musician to quickly adapt to because they have a french filed cut that has commonly been used by most manufacturers. 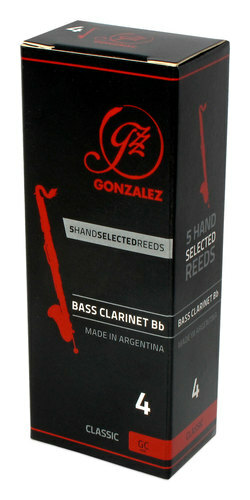 However, the Classic reeds add a level of consistency and quality that is superior to their counterparts and is only present in the Gonzalez range of reeds.The Gonzalez cane is grown and cultivated naturally in the foothills of the Andes on the worlds largest cane plantation and benefit from the perfect eco-system for developing consistent cane that produces excellent results. Gown and cultivated totally naturally in the foothills of the Andes. French filed cut offers quick and clear articulation and response. Available from strength 2 upwards in half strength increments.